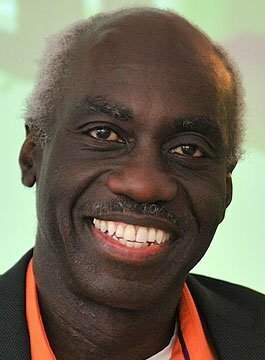 Eddie Obeng is world renowned keynote speaker, educator, author and visionary. Eddie is an authority on Leadership, Change and Innovation. He is a Professor at the School of Entrepreneurship and Innovation at Henley Business School and the founder and Learning Director of Pentacle – The Virtual Business School. Born in Ghana, Eddie was educated in England at Cranleigh School, University College London and the Cass Business School. At 32 years old, he was the youngest business school executive director in Europe at Ashridge Business School and learned the skills and competences needed to ‘herd cats’. An early career with Shell prepared him for globalisation and complexity. In 1994, he founded Pentacle, the world’s first Virtual Business School which forces him to ‘take his own medicine’ and practice what he preaches. Pentacle is a revolutionary business school, providing executive and management education to the world’s most innovative organisations. By the age of 45, Obeng had researched and invented all the frameworks for an entire alternative MBA, based on the premise that the world is complex and changes faster than most organisations can learn. The innovation bursts at Allianz Cornhill, Danone, Rank and Cadburys. The delivery of successful innovation projects at IDEO. The delivery of projects in Telefonica, JPMorgan, GlaxoSmithKline, Cazanove and EA. The successful deployment of technology at Citigroup. Inspiring change and leadership in HSBC, Co-op. The 4 types of change. As a motivational speaker, Professor Eddie Obeng delivers unforgettable, powerful keynote presentations. He covers subjects including Digital Transformation, Leadership, Innovation, Change Delivery Projects, Organisation Design for Agility, Behaviour Change and Mindset Shift. What strategic mind-set & leadership toolkit do you need to navigate the current global uncertainty? Thinking-Together & Working-Out-Loud – Increase productivity and global alignment. Transformation programs are failing us. How to re-form your legacy organisation to outperform digital disruptors? Successful speed. How to coordinate “Foggy” change in a turbulent business environment. At high levels of innovation resistance rises. How to get just about anyone to follow your lead when doing something new. Visions and strategies for the future of work in a world where machines are stronger and smarter than us. Eddie is unique among Digital gurus. He lives what he talks about. For the past five years Eddie has lead a globally dispersed business using digital tools & skills in an extraordinary.